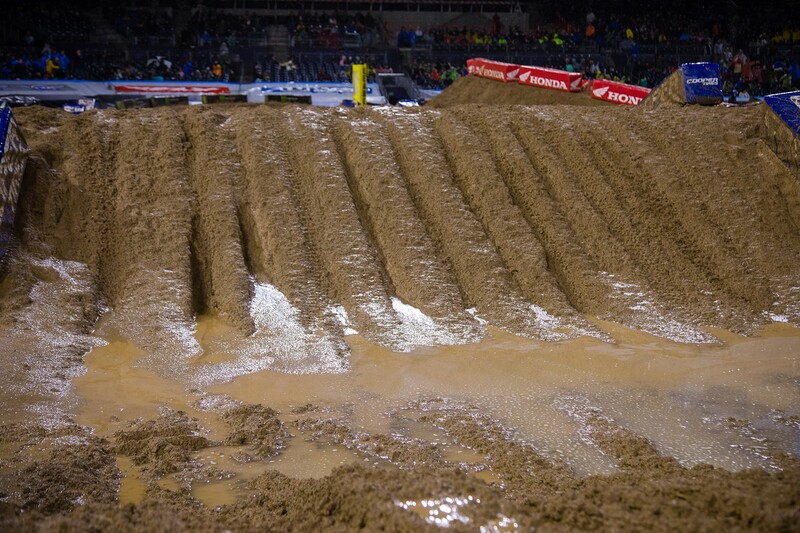 The American Motorcyclist Association has released a brief statement on the track conditions at the San Diego Supercross--which has drawn the ire of riders who have reported burns they suspect came from a drying agent inside the muddy dirt, which riders suggest is lime. Riders have reported skin problems, and motorcycles took a beating. You can read about it from yesterday's news post. PICKERINGTON, Ohio—The American Motorcyclist Association is coordinating with AMA Supercross Championship promoter Feld Entertainment to identify riders and equipment that may have been affected by track conditions at the Feb. 2 event at PETCO Park in San Diego. "The well-being of our members is a top priority of the AMA," said AMA Chief Operations Officer Jeff Massey. "AMA staff is monitoring the situation and working directly with Feld Entertainment as its representatives contact individual riders to assess the extent of the impact." Jason Weigandt hits some topics in the latest podcast.